Comfort for the dietary management of colic and constipation. For the dietary management of colic & constipation. Easy to digest. Nutritionally complete. Oligosaccharides (GOS/FOS). Structured vegetable oil. Why choose Cow & Gate comfort? It is important to consult a healthcare professional before using this product. If your baby is suffering from colic or constipation, you'll know how unhappy these issues can make little ones, inside and out. Colic and constipation may affect babies due to the immaturity of their digestive systems, which can sometimes make digestion uncomfortable for them. 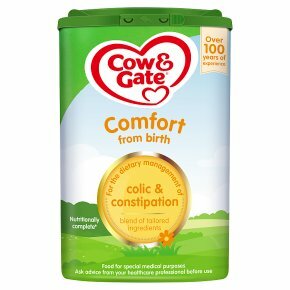 Cow & Gate comfort is a specially designed for the dietary management of colic and constipation. Made with reduced lactose, partially digested whey proteins and structured vegetable oil, it's nutritionally complete, so you can use it from birth or as part of a weaning diet from 6 months. Reduced lactose* *contains 39% of the lactose in Cow & Gate Stage 1 formula Common symptoms of colic and constipation to discuss with your healthcare professional. Colic Intense and inconsolable crying episodes that last several hours Flushed face, clenched fists and legs pulled up to the chest Constipation Infrequent, hard stools All babies are different, but the dietary management of colic and constipation can take up to 2-3 weeks. If you've used this product for this time and you see no difference, we recommend you talk to your healthcare professional. Ready for the next stage? If you think your little one is ready to move on from Cow & Gate comfort, speak to a healthcare professional about the most suitable milk for your baby. No formulation change. Same ingredients, same taste. Food for special medical purposes<br>Ask advice from your healthcare professional before use<br><br>Important notice<br>Cow & Gate comfort is a food for special medical purposes for the dietary management of colic and constipation. It should only be used under medical supervision, after full consideration of the feeding options available including breastfeeding. Suitable for use as the sole source of nutrition for infants from birth and as part of a balanced diet form 6-12 months. For enteral use only.<br><br>Dental advice<br>Do not allow prolonged or frequent contact of milk feeds with your baby's teeth as this increase the risk of tooth decay. Ask your healthcare professional or dentist for advice. Make sure your baby's teeth are cleaned after the last feed at night.